After two decades of thrilling his teeming fans with his rib cracking joke, popular comedian and united nation ambassador, Amb.Francis Agoda a.k.a I Go Dye will be embarking on a world tour. We also gathered that the ace comedian will be taking his brand I Go Dye Standing to other European cities also to America,Canada and Asia. This year the comedian has decided to embark on his world tour to thank his fans for the love and support since the past two decades. 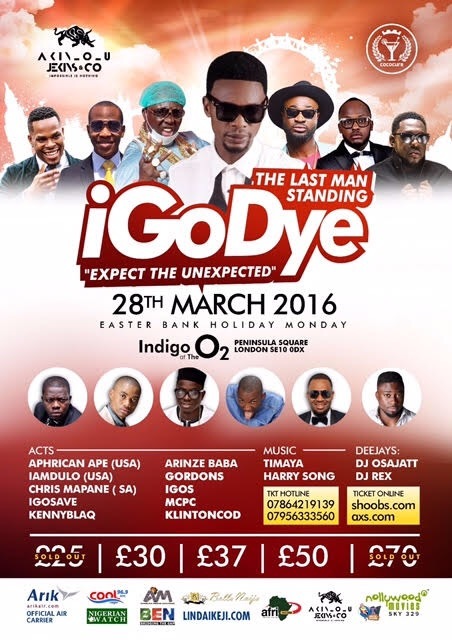 It will be remarkable on 28th March 2016 Easter Monday ‘BANK HOLIDAY’ An event for fun, comedy and music lovers, as I Go Dye will be standing on a “Diplomatic Mission,”. This event will be hosted by McPc also billed to perform are Aphrican ape,Chris Mapane, Gordons, KennyBlaq, IamDulo , HarrySong, Timaya, I Go Save, KlintOnCod . This show is unveiled as one of his world tour starting with the UK tour at the indigo, O2 London, UK according to the UK event promoters Akinlolu JEKINS. This tour includes Leeds and Manchester.